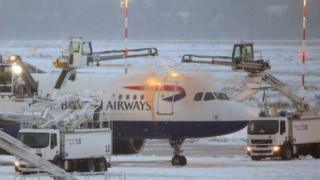 Dozens of Scottish flights have been cancelled as freezing conditions continue in England. Heavy snow and freezing temperatures caused flight chaos at airports south of the border on Sunday. Scottish airports were expecting disruption to flight schedules to continue throughout the day on Monday. Edinburgh Airport reported 46 cancellations by mid-morning, and was expecting to receive diversions from other airports as the day progressed. Passengers flying south from Glasgow and Aberdeen Airports were also facing disruption. Three flights were diverted into Edinburgh on Sunday night, including one from Marseille. Airport spokesman Gordon Robertson told BBC Radio Scotland: "It's a fluid situation. "We saw three diverts to Edinburgh last night and we are expecting more today and obviously we are open and available to take those as required." Scotland's airports are open and operational but the conditions down south and Sunday's cancellations have put aircraft and crew in the wrong locations. Mr Robertson told the BBC's Good Morning Scotland programme: "We have no issues - all of the cancellations are down to issues elsewhere. "We have all our snow teams on alert and our main issue at the moment is de-icing aircraft. "The London airports are affected, in the main Stansted and Heathrow. "We have a number of flights to London and the Midlands every day and those are bearing the brunt of it." Glasgow and Aberdeen Airports were also reporting cancellations to several flights heading to England and Amsterdam. A spokesman for Glasgow Airport said there were 17 cancellations in total: "We're open and fully operational, however, we've experienced a number of cancellations. "This is due to adverse weather conditions at other airports." The advice for passengers is to check with the airline before travelling to the airport. Scotland continues to deal with low temperatures and wintry conditions. Sunday night saw a temperature low of -10C at the Erskine Bridge, and on Monday morning the mercury dipped to -8C in Dumfries. Five Aberdeenshire schools were closed and in the Highlands 24 school sites, including a secondary school and several primaries and nurseries, were closed or partially closed due to the weather.